« Wait…..there’s more hot off the press! The other “end” of the table – Saturday Morning. 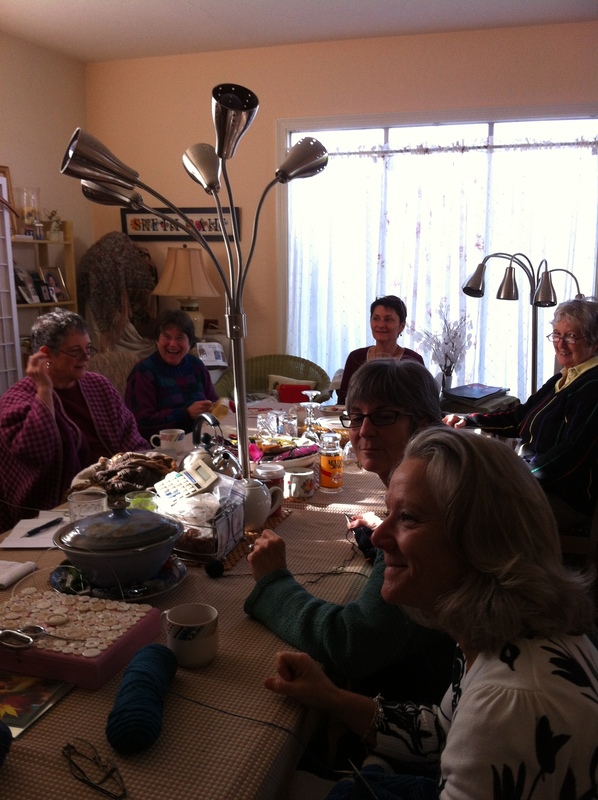 Our Saturday knitting workshop has so many wonderful things to share….knitting, stories….support (Katie just lost her uncle)….and amidst it all – laughter! I am way behind in sharing the creativity but today I am sharing some of the latest of this group. 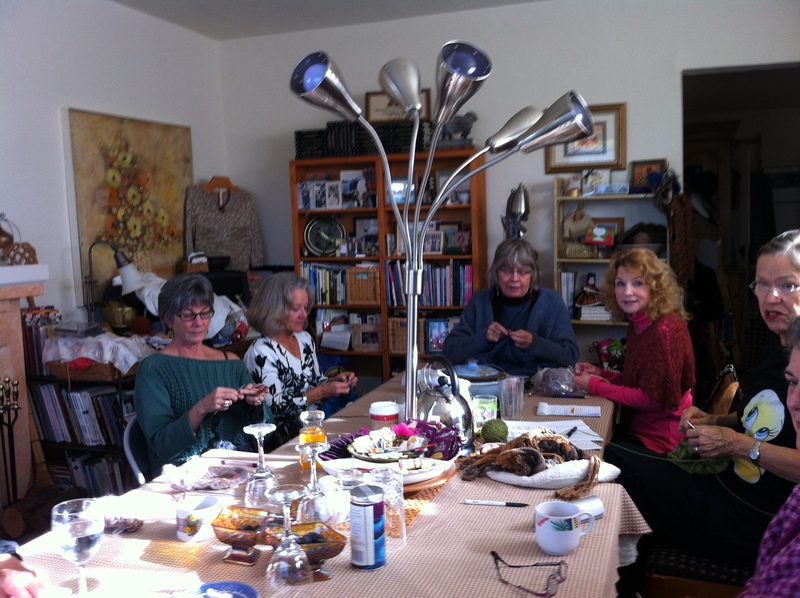 We always knit when we come together on Saturday mornings….but sometimes we don’t get the “show and tell” of our knitting done…we are too busy settling “state of affairs”. This past week we brought our “show and tell” back to the surface! Here’s what is on some of our needles along with some quotes. 99 Garters Rows on “the wall”! I think the favorite of the day when Susanne reminded of us “99 bottles of beer on the wall” as she began singing “99 rows garter stitch to go”! She is on the last block of the “Moderne Log Cabin Blanket (pattern can be found on page 78 of Mason Dixon Knitting). This pattern has been ever popular in this Saturday morning circle..I have knit a couple and I think Susanne is completing her third one…I know Diane has knit one or two. This particular rendition from Susanne is a wedding gift for her son. 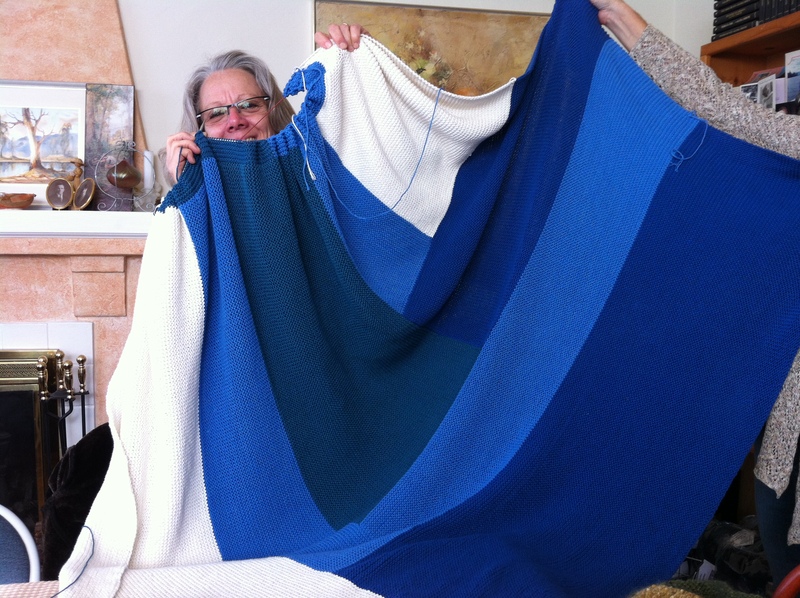 Marsha – knitting Marty’s Afghan pattern! There were a couple more blankets/afghans at the table. 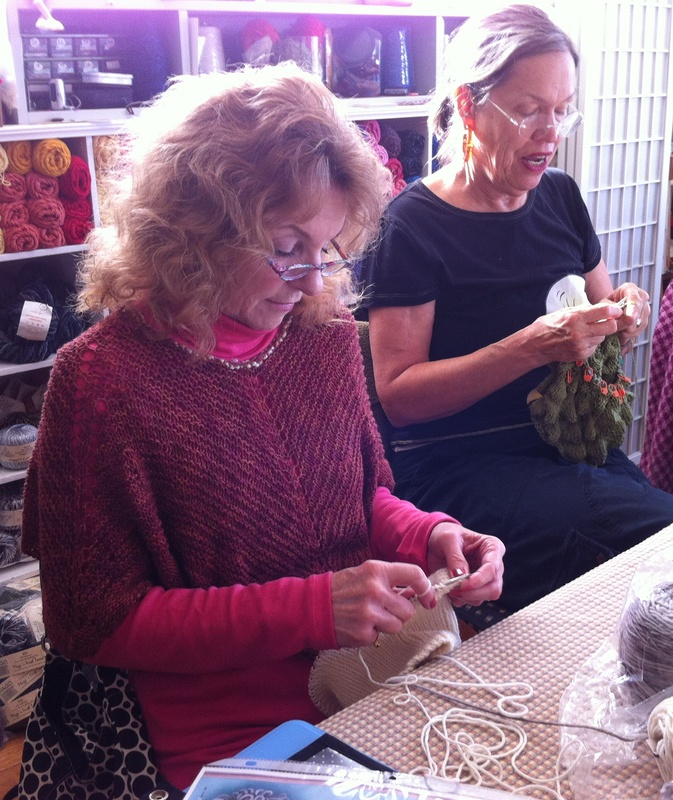 Marsha is knitting “Marty’s afghan” in Lorna’s Laces Shephard Worsted. 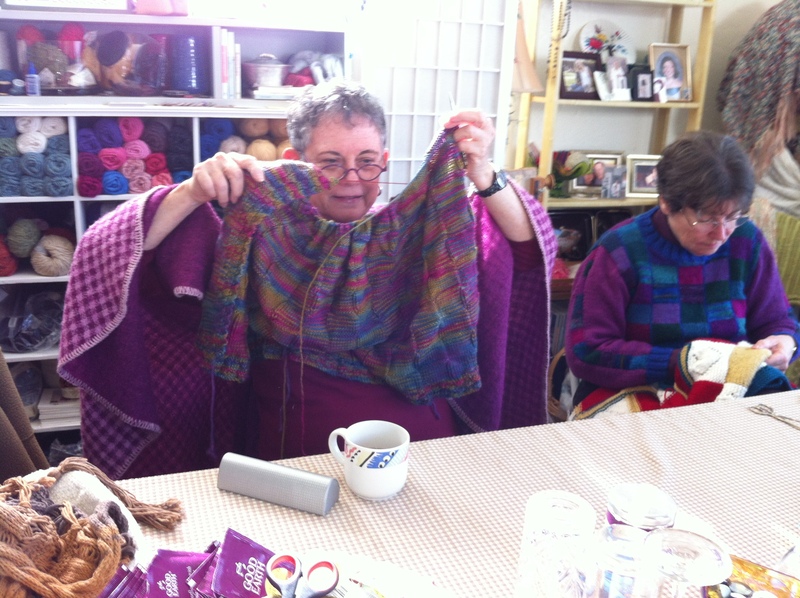 It is her comfort knitting…the kind that she does when she just needs quiet space. Terry is weaving in the ends of her recently completed baby gift afghan! 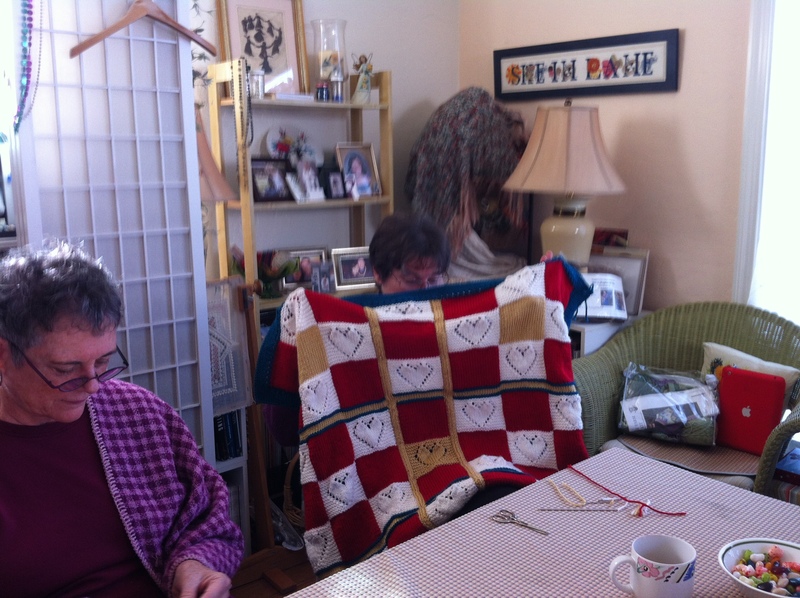 This is Terry’s 7th or 8th Heart Inspired Afghan…in this case the baby is due in two weeks! There’s more! 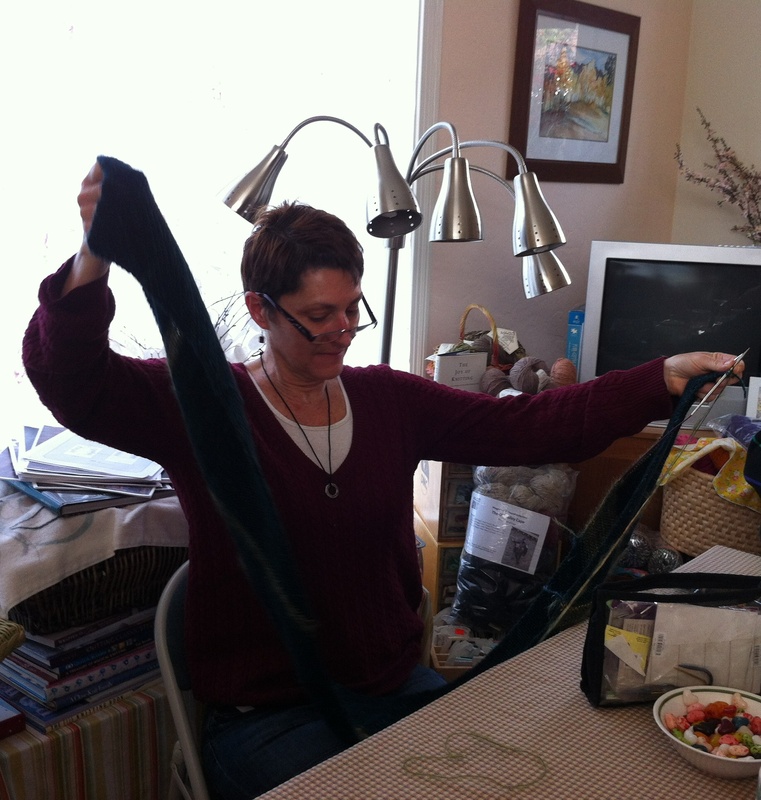 Maurie is finishing up a hat….Janie is knitting a cowl….Katie is finishing up a diagonal scarf. Each of the fibers used on these projects catches the eye! I showed a “learning” which I will post separately. Other projects were shared but we didn’t get close ups of Diane’s latest project or Carol’s bolero or Ann’s socks. More will be revealed as Diane likes to say. Also, Shari sent a photo or two of her recently completed Scottish socks…which I will also post separately and hopefully along with some dance photos that are in my archives. 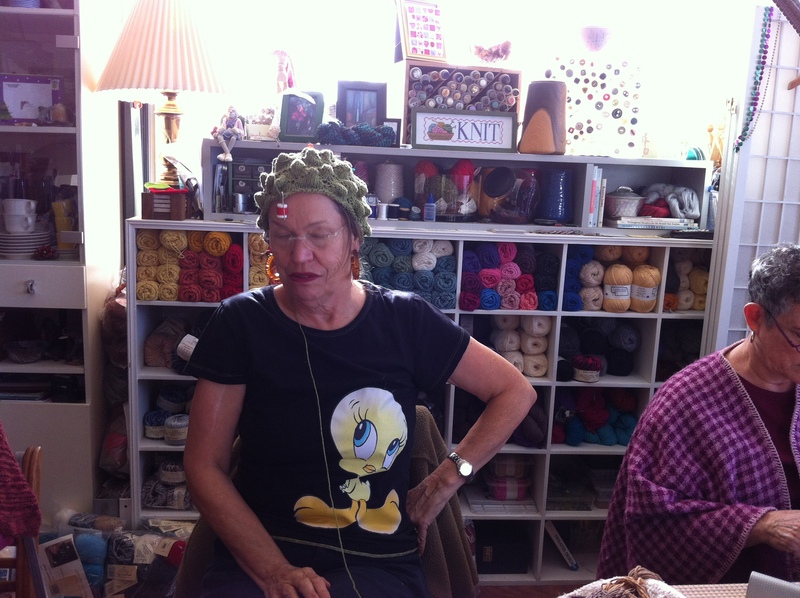 Maurie is really much happier with this hat than she looks…Susanne is going to be “gifted” with this. This group will be celebrating “tis the Season” with its annual brunch on Dec 15!